The 72 year-old former customs officer, emerged on Sunday as the opposition's standard bearer for the 2019 election, to face incumbent Muhammadu Buhari. "God will never forgive me "
"From the day I nominated Atiku to be my vice, he set his mind not for any good, benefit or service of the country, but on furiously planning to upstage, supplant or remove me at all cost and to take my place. "That was what I brought him for, but he was impatient and over-ambitious. He was not ready to learn and to wait. His marabout, who predicted that despite being elected as governor, he would not be sworn in as a governor, which happened, also assured him that he would take over from me in a matter of months rather than years. "All his plans, appointments of people and his actions were towards the actualisation of his marabout's prediction. Once I realised his intention and programme, I watched him like a hawk without giving any indication of what I knew and letting down my guard. I could not succumb to the distraction, diversion and malevolence of an ambitious but unwise deputy. "The work in hand was more important than a confrontational relationship with my deputy, a man over whom I knew I had far more experience and outreach in all matters. To alert him of what I knew he was up to, would only lead to lying, denial, more mischievous plans and more duplicity on his part. "He was better managed that way. What was important was not allowing myself to be surprised or outmanoeuvred by him. I must always seize the initiative and know what was going on if not in his mind, but at least in his camp. That I did very effectively. "Sometime in the fourth quarter of 2004, an associate of Atiku came to my residence at the Aso Villa from Atiku's official residence. He felt uncomfortable and I tried to make him feel at ease. Then, he settled to tell me the story of what had just transpired in Atiku's residence. I listened with rapt attention. "He went on to say that Atiku told him that for him to become the President of Nigeria, the 2007 elections were only a formality. "The seven ingredients he needed for his enthronement were already in his hands. He controlled the National Assembly because both the President of the Senate and the Speaker of the House of Representatives were in his pocket. He controlled twenty-eight out of thirty-six governors. He had control of the media. His influence over the judiciary was overwhelming. "What he needed was foreign endorsement and for that he had employed two lobby groups in the US and one in the UK. And finally, the money for the elections was in his purse. "When the man finished, I thanked him without passing any comment. The man was surprised at my reaction and asked, 'You have nothing to say to these?' I said that I had nothing to say and I immediately called my ADC, Chris Jemitola, to play a game of squash with me. "On our way to the squash court with my ADC, I said, 'People at times make plans and leave God out of their plans.' My casual remark struck Chris and he said, 'Sir, that was a profound statement.' I said that I made the statement because of what I had just heard of Atiku's plan. I was not convinced he had put God in his plans. "Atiku was confident and God was laughing. Most of Atiku's ingredients soon started to fall out of place one by one. The first was the party, PDP. "He thought I was powerless and had no clue about the execution of his plan with his group; part of his attack on me was for national chairman of the party to give the first salvo, then other things would follow as his grip on the party would be firm and consolidated. 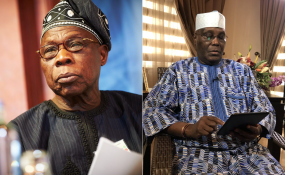 "That salvo came in the form of a letter to me from the chairman of the party, Audu Ogbeh, who had fully defected with (Iyorchia) Ayu to Atiku. "The letter, which was not the product of any issue or matter discussed with or at any party meeting, came suddenly. When I received it, I could read the sinister intention behind it. "I spent that night writing my reply and I sent it in the morning. My reply was clear. I wondered why Atiku and his group did not realise that with my reply, the battle line was clear or maybe they thought that the seven ingredients would remain intact to the end. "My assistants had moles within the Atiku group. Anything that they planned would be reported. That was the case after Ogbeh's letter. They decided that Ogbeh should appear remorseful and come with the National Working Committee to apologise to me. It was not from their hearts, but to lure me to a 'killing ground'. "All pieces of information that were reported were verified because it would not come from only one informant. "Timely information is a very important principle of war and also of politics. In politics, just as in war, what matters is not just your plan, but knowledge of your opponent's plan. Knowing their plan, I had the choice of playing along with them or being firm, I chose the latter. "I told Ogbeh that my relationship with him as national chairman and me as national leader of the party was based on mutual confidence and trust. But with his letter, my reply and what I knew of him then, I could no longer work with him in confidence and trust. "There were only two choices left for both of us in our best interest and that of the party - he, leaves as chairman or I leave as leader of the party. "The following Sunday, I called at his house, which I had done on several occasions in the past when there was an important party matter to discuss. This time, I asked him to give me an undated letter of resignation as the national chairman. "I waited, he gave me but it was wrongly addressed to me rather than to the national secretary of the party as stipulated in the party's constitution. "Ogbeh reported to his group and it was decided by them to play on and to wait for my disgrace whenever I presented a letter of resignation not addressed to the national secretary. "The informants did their job and I, once again, paid another visit to Ogbeh at his residence. He entertained me to a meal and drink, and changed the addressee on his letter of resignation." "How can I be on the same side with Atiku?" Mr Obasanjo asked. "To do what?" "If I support Atiku for anything, God will not forgive me. If I do not know, yes. But once I know, Atiku can never enjoy my support," he added. "I do not have personal grudges with anyone," Mr Obasanjo said. "If you do not do well for Nigeria, you do not do well for all of us." "It is not a question of working with or not working with an individual," he said. "If you are working for the good of Nigeria, I am working with you. If you are not working for the good of Nigeria it does not matter who you are I am not working with you." "Most of you do not understand the way I operate," Mr Obasanjo said. "And I thought your own paper will understand better." "I know Atiku very well. And I have mentioned my position with Atiku. My position has not changed," he said. "If my children are getting married, he has sent representatives. If his children are getting married, I have sent representatives. That is social. That is not political".